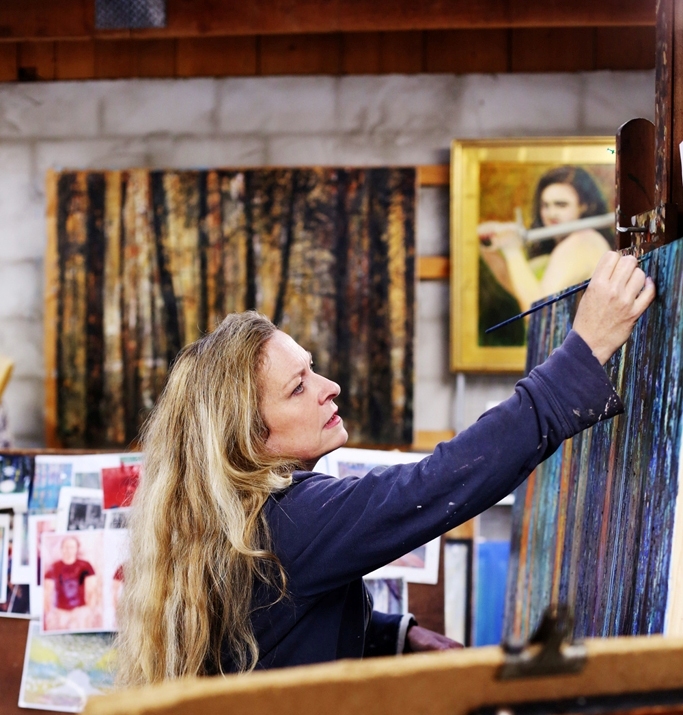 Exciting new art exhibitions are unveiled all week long, all over Chester and Delaware County, including the famous 41st Annual Unionville Art Gala this weekend in East Marlborough at Unionville High School. 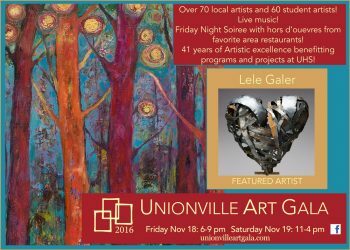 The Unionville Art Gala is the largest group art show of the season, starting this Friday November 18, 6-9pm and Saturday November 19 11am – 4pm. This wonderful art show includes 70 professional and 50 student artists, with myriad artistic mediums including, painting, photography, sculpture, jewelry, wood carving and ceramics, as well as an art silent auction, all benefiting the education programs at Unionville High School at 750 Unionville Road in Kennett Square. The featured artist is Lele Galer, local artist (me, actually) known for her large welded metal sculptures and heavily textured and brightly colored paintings. After heading the Art Gala for many years, as well as many public art projects and programs throughout Chester County, Lele turned to her art studio and started painting and welding metal sculpture for exhibition. The Unionville Art Gala is one of the only shows that combines a show of student art with professional working artists, and that is always an inspiring mix, for artists and viewers alike. Friday night’s reception is a hugely popular event from 6-8pm with live music, complimentary food and refreshments and a lively atmosphere for the whole family. For a fun discussion about the Art Gala, go to Gene Pisasale’s website www.GenePisasale.com and check out Living History radio November 9th interview for the Art Gala. 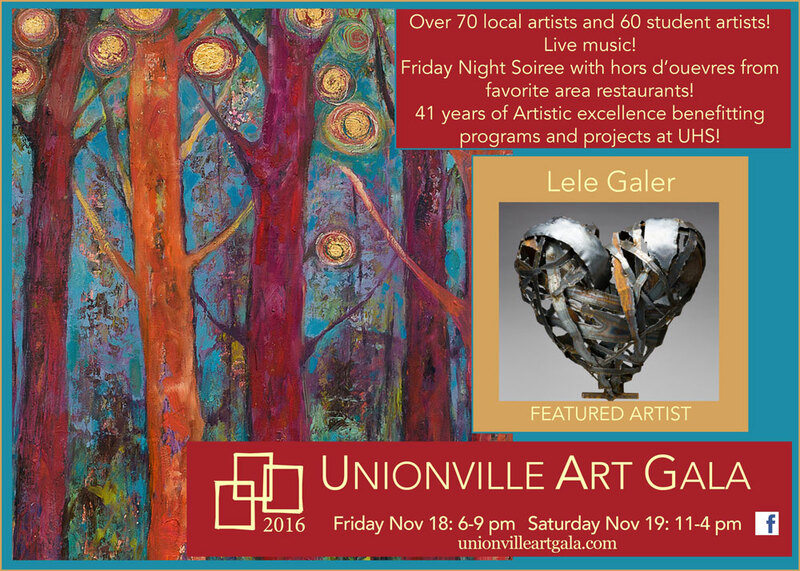 The Unionville Art Gala is a great, free art show, chaired by Carol Apicella, and one of the art highlights of the year in Chester County. In West Chester, The Art Trust at The Meridian Bank, 16 W Market Street, opens their annual “Gifted” art show with an artists’ reception this Friday November 18th from 5-9pm. 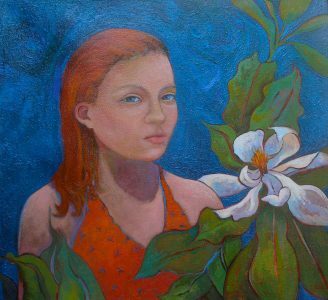 The show continues through December, and features smaller, reasonably priced artworks from 17 selected area artists including Martin Campos, Ben Richardson and Lorraine Glessner. “Gifted” is always a wonderful show, with something for everyone, in a variety of mediums. Come meet the artists and start up your holiday shopping! Girl with Magnolia by Lauren Litwa Holden, as featured at the Galer Estate Winery show. 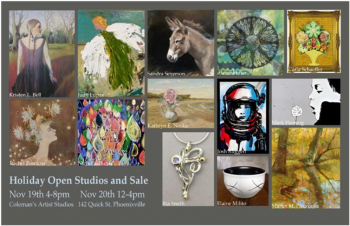 In Phoenixville, Coleman’s Artist Studios, located at 142 Quick Street in Phoenixville, is hosting an open studio this weekend, November 19th and 20th, with 12 participating local artists including : Kristen Bell, Rachel Romano, Ria Smith, Katherine Noska, Martin Pieczonka, Judy Lupas, Alicia Miller, Nicolas Burns, Carla and John Scheffer and Sandra Severson. Rachel Romano has some beautiful paintings also currently showing at Mala Galleria in Kennett Square, and Sandra Severson was part of a terrific group show at Church Street Gallery in West Chester. Also for you artists and art teachers, The Phoenix Village Art Center has a shout out for any art teachers interested in teaching at the Center, to please contact them about the sort of class that you would like to bring to the Phoenixville area. In Oxford To kick start the holidays, The Oxford Arts Alliance holds its annual Artisan Gift Shop November 18-December 23 in their gallery at 38 South Third Street. Featuring myriad art and artisan artworks, this show is designed for the person who loves to buy gifts that are artistic and one-of-a-kind. A percentage of sales goes to support the many free programs that are offered to the community throughout the year. In Malvern, the Malvern Art Stroll starts on the first Thursday of the month, so this Thursday check out Malvern shops for pop up art shows and galleries for openings. Gallery 222 at 222 East King Street in Malvern, has its artists’ reception this Thursday night from 5:30-8pm for 2 exhibitions showing through December 17th: the clay work of Rhoda Kahler in the West Gallery and paintings by Barbara Berry in the East Gallery.. Barbara Berry’s work explores the uninhibited side of nature which is described in her evocative handling of paint and color. Rhoda Kahler’s clay works are inspired from nature, embracing texture, line and emotion through the form of the object. She has small and large clay tile pieces as well as vessels and standing sculpture. Barbara Berry’s pastels and oil paintings are also inspired from nature. She captures the ever changing beauty of a landscape, inspiring a nostalgic memory or a pause to appreciate the beauty surrounds us. Check out Malvern this Thursday for Art Walk and the Gallery 222 artists’ reception! 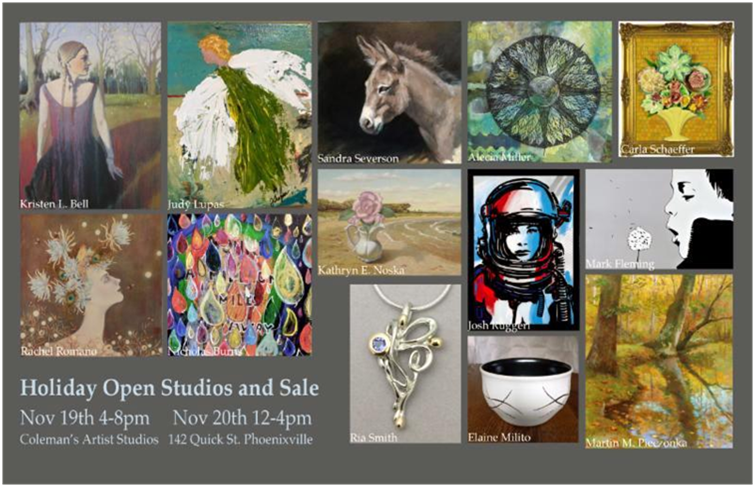 In Aston, Heron Studios continues its holiday art show and sale through this weekend only, November 19 and 20. 15 local artists will be exhibiting and selling their work that ranges from paintings, to jewelry, ceramics, wood, sculpture, fiber and more. Heron Studios is a collective of working artist studios in an old industrial building at Red Hill and Mount Road in Aston. It is a cool space with a great vibe, and draws many hundreds of art lovers and holiday shoppers every year for this great annual art event. 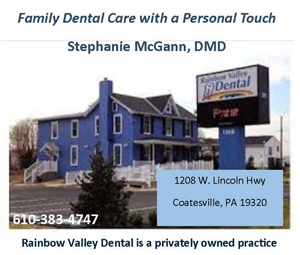 It is just about 5 minutes off of Route 1, and they have plenty of parking. In Wilmington, The Delaware Museum of Art continues it blockbuster show “Truth and Vision: 21st Century Realism” through January 22, one of my favorite art exhibitions of all time. The “Slow Art Tour” of this exceptional show is 1pm on November 20 (Sunday), with a curatorial discussion of the masterpieces by Stone Roberts. On November 17 (Thursday) at 6pm, one of the exhibiting artists, Stephen Assael will discuss his work, which includes stunning drawings as well as paintings. In Quarryville, The Charles X. Carson Octoraro Art Association will exhibit in a group show in the Carlson Room of the Quarryville Library, in Quarryville, PA from November 16th through January 4th. The artists’ reception for the show will be this Saturday from 1-3pm, hosted by the Quarryville Library Art Committee. The show offers a range of media including watercolor, oil, acrylic. Mixed media and ceramic work. Universal Harmony by Tremain Smith, who is showing in Newtown and Wayne this weekend. In Wayne, Freeman’s Main Line at 503 West Lancaster Avenue, opens an exhibition on the multi media and encaustic work of Tremain Smith entitled “Contemporary Expressions: A Regional Artists Installation”, which shows through December 9th. Tremain Smith is a very well known and respected artist and teacher who has numerous works in public and private collections around the country, including 4 pieces in The Metropolitan Museum of Art. 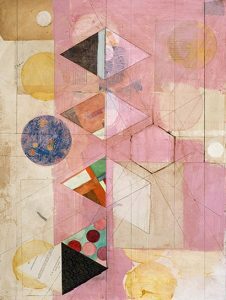 She utilizes a variety of mediums together to express a spirituality through abstract and geometric lines and patterns. Next Wednesday November 23rd there will be an artist’s talk by Tremain Smith from 1-2pm. The show benefits The Jubilee School & Art Sphere Inc.
Tremain also has an artist opening reception this Sunday, November 20th from 3-5pm for his solo art show at Pennswood Art Gallery (next to The George School) at 1382 Newtown Langhorne Road in Newtown PA.